Vegetables (43%) (Dried Potato (Emulsifer (471), Stabliser (450), Acidity Regulator (330), Turmeric), Potato, Onion, Green Beans, Carrots, Peas), Water, Sunflower Oil, Potato Starch, Dextrose, Salt, Skim Milk Powder, Whey Powder (Milk), Emulsifier (471), Potato Flavour. Preheat oven to 200°C fan forced for 10 minutes. 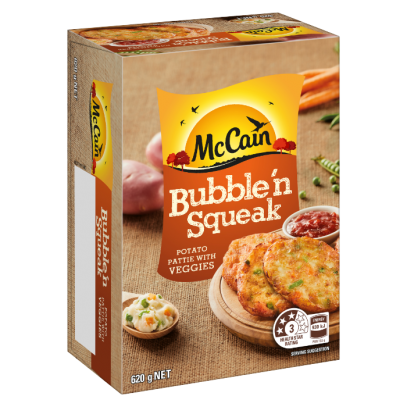 Spread McCain Bubble and Squeak in a single layer on the oven tray and place in the top half of the oven. Bake in oven for 10 minutes, turn and continue heating for a further 7 minutes until they’re lovely, crisp and light golden. Regular turning is unnecessary. Mmm…Bubble and Squeak. The following cooking instructions are based on 155 g of product. For different quantities adjust the cooking time accordingly. For best results cook from frozen. Do not overcook and watch carefully during the final minutes of preparation.